Alien Effects – 100+ Years After "The War of the Worlds"
It’s been over 100 years since the serial publication of H.G. Wells’ The War of the Worlds (1898) introduced us to the terrifying concept of alien attacks. The 1938 teleplay version incited panic in the listening public and has become the stuff of legends. We are still being inspired by the idea to this day. A plethora of books, games, and movies from scary to silly with settings ranging from Earth to galaxies far, far away have followed in the wake of Wells’ ground-breaking story of extra-terrestrials. In turn these iterations have inspired real-life scientific breakthroughs as well as fantastical imaginings of worlds far away. Our homage to the alien incursion genre takes a much less serious edge than some, while still embracing that tension and turmoil so essential to capturing the true spirit of the theme. We Come in Peace is a fast-paced, exciting game of exponential chaos. It’s “no guts, no glory” in this dice-rolling game of aggressive extra-terrestrial warfare. 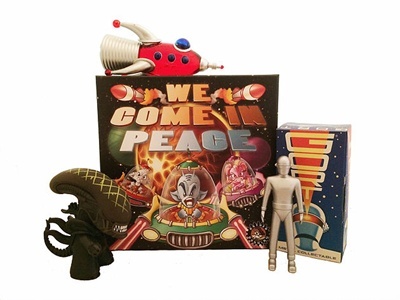 Available now for your gaming pleasure, We Come in Peace is a great addition to any space fanatic’s collection, no matter what universe they call home! First published on this date back in 1937, JRR Tolkien’s classic fantasy tale of adventure has inspired us to be brave and bold in our lives. The Hobbit holds a special place in our hearts here at Rather Dashing Games and dreams of dwarves and treasure have held our imaginations captive for ages. Whether we wander far and wide, or just want a quiet life in the Shire, we all seek a little adventure in our own way. Playing games is one way we indulge our inner dwarves. 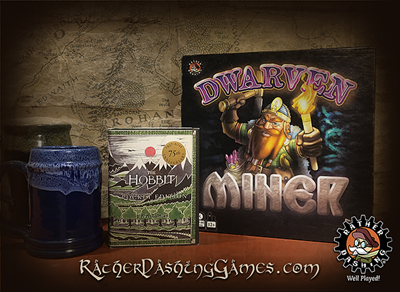 Check out Dwarven Miner for a fun take on the fantasy genre. What are your favorite fantasy games? How has Tolkien’s Middle Earth inspired you?